Calendar II in central Vermont is perhaps the most famous of the Vermont chambers. 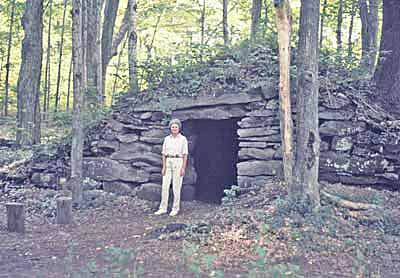 Standing to the left of the mouth of Calendar II is Betty Sincerbeaux, perhaps more than anyone else, was responsible for waking the rest of us see the reality of this lithic culture in Vermont. Photo by Byron Dix. The interior of the chamber. 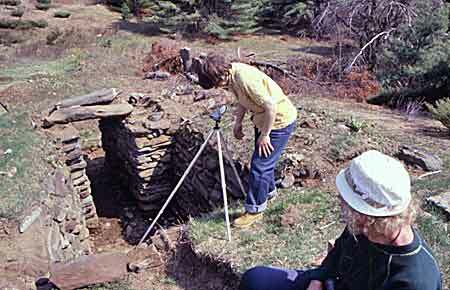 This is the biggest chamber in Vermont, and perhaps in all of New England, measuring ten feet by twenty feet (approximately three meters by six meters). This ratio of 20:10 / 2:1 is found in the King's chamber of the Great Pyramid. There are seven massive lintel stones that span this width. Notice the flue hole/opening in the ceiling at the back of the chamber. See the candle in the back? This is evidence of its use as a ceremonial centre. 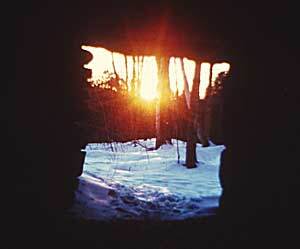 Winter Solstice Sunrise as seen from the back of the chamber of Calendar II. Notice that the sun is rising through a notch in the hills. Many chambers in New England are oriented towards significant horizonal astronomical events. Sacred sites do not have the same degree of spiritual energy throughout the year. One of the best indicators of when a site is at its "hottest" is when the major axis aligns to a significant horizonal astronomical (in this case Solar) event. Photo by Byron Dix. Are significant sacred geometrical ratios found by taking three length measurements and three width measurements, dividing each by three, and then dividing the average width into the average depth? This yields a ratio of something to the number one. In the case of Calendar I, above, the ratio is 1.617 : 1. Phi (Ø) is a basic sacred geometrical ratio is 1.618 : 1. 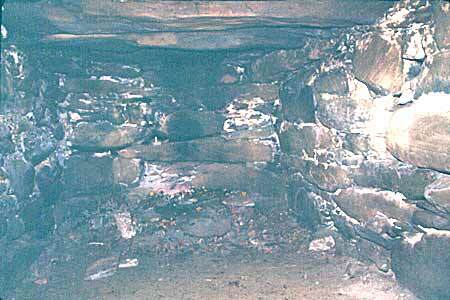 Were there common patterns of Earth energies in these chambers? We found this to be the case in many of them. One view of the Equinox Sunrise at Calendar I. The chamber faces a high ridge that runs North-South. There are peaks at both ends of the ridge, and a saddle, or dip, in the middle (where the Equinox sun rises somewhat south of East due to the angle of elevation to the horizon. Photo by Byron Dix. 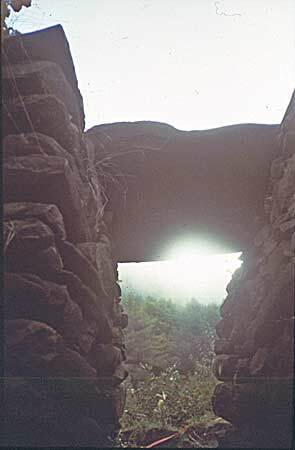 The Equinox sun rise from a lower angle, within the same chamber. As you can see from the picture to the left, there is a significant angle of elevation to the horizon, so while, given a level horizon, the Sun rises due East anywhere on Earth at both Equinoxes, the Calendar 1 chamber is oriented somewhat south of True East to make the alignment. Photo by Dorothy Todd. 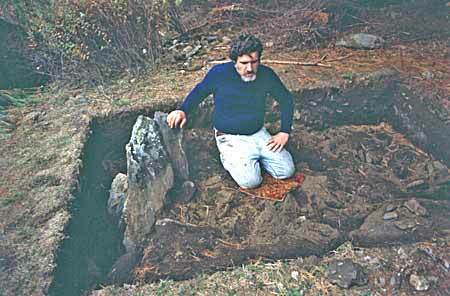 Archaeoastronomer Byron Dix at a stone he found central to the astronomy at Calendar I. Here he is demonstrating how he was kneeling when something like an enormous shock had literally thrown him off the stone! It is standing with one's foot wedged against this stone that the Winter Solstice Sunrise can be seen (see next image). A North/South ridge rises sharply to the East of Calendar 1. The angle of elevation to the horizon is significant; therefore, the Sun rises much further to the South than it would be with a level horizon. 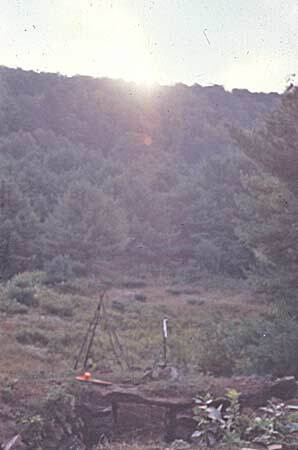 The Equinox Sunrise as seen from the Calendar 1 chamber occurs in a saddle in that ridge. 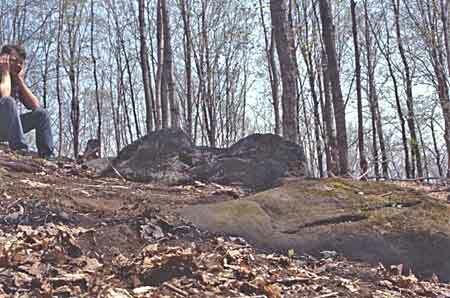 This stone is at the top of the southern end of that north-south ridge. When standing at that central stone, the first gleam of the rising Summer Solstice Sun can be seen through this notch!